Soon each of us will be 90. I consider myself very lucky to have almost reached this age and still be able to care for Manya and to know she would do the same for me. It is a difficult and long road to travel. My wife was born in Germany almost 90 years ago and her parents named her Manya, however the Nazis claimed that this was not an appropriate German name and forced them to change it to Ruth Manya on all her documents. She is still known to everyone only as Manya. At age 15 she and her family managed to depart from Germany on the Bremen, the last ship Hitler permitted to leave port, but Manya’s grandmother, who lived with them, had no visa and was left behind to perish in one of Hitler’s labor camps in Gurs, France. I met Manya soon after she arrived in this country and even as a teenager I knew that we were destined for one another. 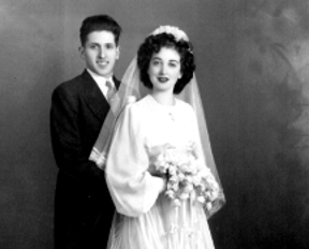 After a three-year separation, while I fought the Germans during World War II, we were reunited and then married within a year, nearly 67 years ago! During our first 55 years of marriage we were constantly together. We raised two wonderful sons, saw them get married, became the proud grandparents of two beautiful granddaughters and a great-grandson, and enjoyed many trips throughout the United States and abroad. But during the past 12 years of our marriage, Manya’s mind has slowly drifted away due to the ravages of Alzheimer’s. We are both 89, and still living together at home, with me serving as her main caretaker along with steady help from a cadre of faithful aides. Although I refused to accept it at first, I knew how serious her condition was on the day I was sitting at my desk and Manya decided to drive to a nearby shopping mall. At first she went out and came back immediately to say that the keys didn’t work; she had taken the house keys instead of the car keys. I gave her the correct ones and I heard the car back out of the garage and into the street. Then I heard her honk the horn repeatedly until I went out to see what was wrong; she said that the car would only go backwards! The next time she tried she did so with no keys at all, but just banged on the steering wheel, shouting, “It’s broken!” I finally realized that her driving days were over. Little things began to make their appearance. We found her washing her face with toothpaste; trying to eat a bar of soap on a plate; calling me out of a class that I was teaching and then forgetting why she had called; screaming at me because she thought I had been away too long for my early morning walk, afraid that we’d miss an afternoon appointment many hours later. One of my sons suggested that perhaps she was nervous that once I left the house I might not come back. One day Manya found a photograph of “the Glassemutter,” a next-door neighbor from her childhood years in Germany in the1930s. She was an elderly woman that Manya had loved dearly; she often spoke of the Glassemutter sneaking her un-kosher strips of bacon and other forbidden foods under her kitchen table. Manya was very excited to see her again in the photo, and promptly left the house and walked across the street, wanting to visit this old friend and show her the picture. Different country; different century. I was quick to stop her before she rang the neighbor’s doorbell, because we were both concerned at that time that “the truth about her condition would circulate too fast.” I guess in those early stages I found it embarrassing to see my wife publicly behave in these odd ways. In fact, even admitting to anyone that Manya had Alzheimer’s felt shameful somehow. I later learned that it was very obvious to everyone anyway! Her memory became very short-lived, of course. Our boys threw us a big 60th wedding anniversary party during which she was very friendly with all the guests, circulating from table to table, dancing, and apparently having a great time. But on the drive home when one of our sons asked her if she enjoyed the party, only minutes later, her reply indicated that she had no recollection of the event whatsoever. Manya once asked me how our granddaughter was related to our former daughter-in-law, her mother. 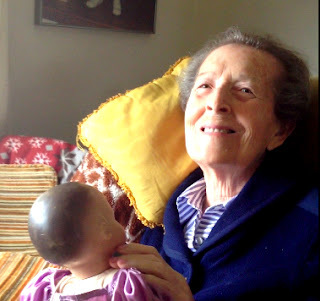 Another time she told our younger son that she would like to meet his mother, and was thrilled and surprised to learn that his mother was German, because hers was as well. What a coincidence! Unfortunately, at that time I didn’t know how to respond to these types of conversations, but eventually I began to learn not to become visibly upset nor to make her feel foolish for asking obvious questions or making highly illogical statements. Violence played a role in the middle stages of her illness. We had to put away all the framed photos in the house because they became weapons with which to attack our aides. And every time she saw herself in a mirror, she would stand there and scream at herself with rage. 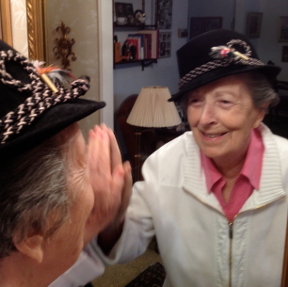 Thankfully, that stage eventually passed and now we watch her laugh at herself in the mirror daily, especially when I put my hat on her head. At one point, after chasing an aide with knife in hand, we had no choice but to place Manya in the psychiatric wing of a nearby hospital. The admitting procedure was so difficult and long—over six hours—that I saved a note I wrote to myself at the time, regretting this action, thinking I’d never forgive myself. To be admitted she had to go through many seemingly unnecessary tests, the worst being asked to give urine against her will. My oldest son witnessed five staff members holding her down as she screamed and they withdrew urine. He promised never to describe to us in detail what he saw; it was simply too horrendous. They also needed blood samples that she fought against until they finally sedated her enough for the nurses to be able to draw blood. Ultimately, of course, she was admitted, and my sons and I stayed with her 12 hours a day for 10 days in order to advocate for the most simple, expected services. We found ourselves having to remind the staff when she needed changing, when it was time for her medications, and how to give her the medications in a way she would take them. I had an elaborate system where I hid her crushed pill in a serving of vanilla ice cream, whipped cream and chocolate sauce. It worked perfectly, yet I had to stand by and witness an insensitive nurse attempt to force-feed Manya her pill by aggressively shoving a spoon down her throat, while she fought her off. Eventually they let me make my special concoction that Manya happily ate without a fuss. Manya had grown very afraid of the bath and shower early on and had only received sponge baths for many years. So it was especially painful to stand in the hospital hallway and watch three nurses drag her into a bathing area and restrain her for a shower while Manya shrieked at the top of her lungs and emerged a few minutes later, shaking, weeping and traumatized. The good news about Alzheimer’s, of course, is that it would all be forgotten within minutes. Looking back, I was wrong to regret putting her in the hospital, because while in there they gave Manya various dosages of medication until they found one that worked for her, and she began to settle down. Now, nearly four years later, although she has her angry moments, especially when the aides invade her privacy to clean and change her, she has never again returned to that extreme form of violence. On the contrary, she is usually in a fairly good if not great mood most of the time, laughing frequently throughout each day. Manya is home now with me as her primary caretaker; I have aides from 8am to 8pm and Manya sleeps through the night with the help of a very small dose of Seroquel. Years ago we promised never to place one another in a nursing facility. But that’s not why I keep her at home; our rabbi assured me that such promises are null and void if I cannot manage. No, I keep her at home because after 67 years of togetherness I still want to be by her side when I go to bed and when I wake up; I want to kiss her good morning and (not always) have her smile and say “I like that” when I kiss her as she opens her eyes; and it is still gratifying that she seems to know me most of the time. And yet it’s heartbreaking at those times when she looks at me and there is no smile of recognition, or when she suddenly hits me in anger for no apparent reason, or takes a glass of juice and spills it all over the table before I can stop her. And, it’s still hard for me to accept the fact that some people must feel uncomfortable, awkward or even frightened to see her in her current state, or perhaps they just don’t know how to relate to her, and as a result seem to have drifted away from us in our later years. I find this difficult but am trying hard to ignore it and instead take joy in the fact that we do have others who provide comfort and help on an almost daily basis. True friends are there when you need them. With God’s help I pray that we will be together for many more years. Max Sobel is a former professor of mathematics at Montclair State University, and a widely acclaimed author of over 60 math textbooks. 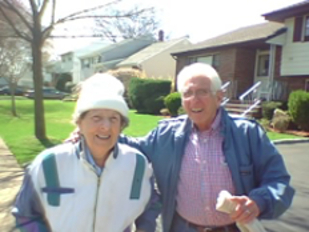 He and his wife Manya have lived in Fair Lawn, New Jersey for over 60 years. He is also the father of Eliezer Sobel, author of Blue Sky, White Clouds: A Book for Memory-Challenged Adults, inspired by and dedicated to Manya.